Cyber security company Symantec plans to formally announce Monday a new trust program for websites under the name Norton Secured Seal. Norton Secured Seal will replace the VeriSign Trusted seal currently displayed some half billion times a day in 170 countries around the world. Symantec began updating websites to Norton Secured Seal on April 17 and is expected to finish the process by April 30. The seal tells consumers that a website meets certain minimum security requirements -- use of encryption while transmitting data, for example, and daily scans for malware infections. Symantec bought VeriSign's authentication business in May 2010 for $1.28 billion. VeriSign's trusted seal program was introduced in February 2010 as a way to assure consumers that a business was who it said it was, and its website was free of malware. This replacement of the VeriSign Trusted seal by Symantec will heighten the visibility of its Norton brand, which is used on the company's antivirus and other security products. According to Symantec, trust seals play an important part in determining a consumer's likelihood of making a purchased at a website. A consumer survey commissioned by Symantec, for example, showed that 94 percent of consumers are likely to continue with an online purchase when they view Norton Secured Seal during the checkout process, more than other seals or when no seal was displayed. While VeriSign Trusted offered SSL encryption, authentication, and malware scans, Norton Secured will offer expanded services, according to Quenton Liu, senior director of engineering for Symantec Web Security Solutions. Those services include vulnerability assessments and privacy protection, he says. "The nice thing about having this Norton Secured umbrella is it gives us the flexibility of adding even more services in the future as it relates to security," he told PCWorld. Those services may reach beyond security. "Security, privacy and authentication is just one part of the puzzle for Internet merchants," he adds. "Ultimately, what they need is trust on their websites and trust sometimes comes in the form of stuff not related to security." For example, consumers want to trust a merchant's website to be up and running when they want to use it. To that end, Symantec also offers business continuity services to its merchant customers, Liu explains. Websites that want to bear the Norton seal pay Symantec a minimum of $399 a year. That pays for Symantec authenticating ownership of the site, an SSL certificate by which consumer traffic to and from the website is protected by encryption, and daily malware scans. Other services can be purchased at additional costs. 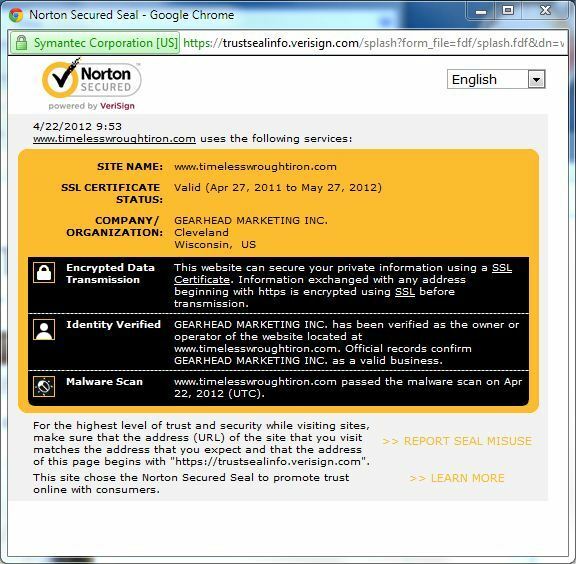 To see what services a website has purchased, consumers can double click on the Norton Secured seal and a pop-up window will appear describing the services. “Norton is committed to helping consumers stay protected, across all aspects of their digital lives," Symantec Vice President for Consumer Worldwide Marketing Sally Jenkins says in a statement. “The Norton Secured Seal is backed by the trusted Norton brand and empowers consumers to browse, shop, and socialize online with full confidence that their personal information is secure."